Fed up with telemarketers who interrupt your day, invade your privacy and waste your time? It is illegal for telemarketers to use machines and pre-recorded messages to auto-dial your cell phone. If you have a landline that is listed on the Do-Not-Call Registry it is also illegal for telemarketers to call your landline. Federal and state anti-harassment laws provide that you can charge telemarketers $1500 and more for each and every one of their illegal calls, plus your court costs and legal fees too. 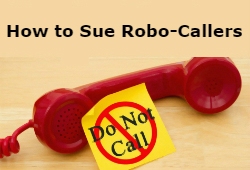 For more info, visit – HOW TO SUE ROBO-CALLERS. I like to sue telemarketers so much that I do not charge people any money out-of-pocket to sue them. I believe telemarketing should go the way of door-to-door sales: a thing of the past. So I sue telemarketers for a percentage of what I can make them pay you. I make no money unless I make them pay you. Needless to say, I think very poorly of telemarketers. Why? See my personal experience with telemarketers. If you are fed up with commercial activity that invades even your home and private life uninvited, such as telemarketers who ignore the National Do-Not-Call Registry, Call-Childress at 505-433-9823.